Do you want to write a cozy mystery but don’t have a clue where to start? Or maybe you’ve begun a story but are stuck on the plot? Perhaps you’re already writing a series, and you need tips on keeping your material fresh? Writing the Cozy Mystery will help you develop your characters, establish the setting, plot the story, add suspense, plant clues and sustain your series. If you have ever thought about writing a cozy mystery, you need to read this book. Everything you need to know about the genre is in these pages. The author gives you a wonderful definition of the cozy mystery genre. There is definitely a difference between a cozy and a traditional mystery. This is the place to learn about it. 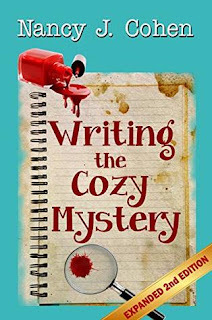 Nancy J. Cohen has a true knack for providing aspiring authors with the tools they need to accomplish their goal of writing their own cozy mystery books. It felt as if she was in the room with me explaining it all in an easy to understand method. It’s, also, a great idea having a book dedicated to writing one specific genre. Every genre has their own nuances. FTC Disclosure: I voluntarily reviewed an Advance Reader Copy of this book from the author. I was not required to write a positive review. All opinions expressed are my own. Thanks so much for your great review, Yvonne! That sounds like a great tool for writers. I've wondered about this one. I think if I ever try to write a mystery (unlikely, as I tend more toward fantasy in my story ideas), I'd be more likely to write a Golden-Age-style traditional or a historical. But I suspect much of this book's advice would be useful to any mystery writer. Yes, Lark, the principles in this book apply to any time period, and to traditional mystery writers as well. Even if you write fantasy, you may want to include a bit of a mystery. That's how I started in the genre. I'd been including mysteries in my scifi romance. The plotting guidelines apply to all genres and don't have to include a murder. It could involve the search for a missing object or person, and you'll still have a group of suspects as I did in Keeper of the Rings. Thank you, Nancy! I never expected the author herself to reply! I will definitely be getting your book. I'm toying with (in a desultory manner) a fantasy novel that has some mystery elements to it. Heaven knows whether I will ever get it off the ground, but the mystery elements are part of what I'm struggling with, so your book could be really helpful to me.